What To Do When You Discover You’re About To Miss Your Q4 Sales Quota? You could be having a conversation with prospects for months and at the last minute, they decide that they will choose the competition over you. You could be using the same arguments that had successful outcome a million times before, but now you can’t seem to get any new customers. Here is what you do about it. Everyone will tell you to stop the negative thinking and we’re telling you – stop it right now! It’s the difficult times that force you to find unusual ways to succeed and it’s called problem-solving. Don’t throw yourself a pity party because it will only lower your self-esteem even more and really get you in trouble keeping you way behind that Q4 goal. Don’t punish yourself and deprive yourself of fun activities trying to close more either, because you will become tired and grumpy seller which nobody buys from. Keep your thoughts positive, always search for a solution and don’t give up at the first sign of trouble. Maybe you need additional motivation that will not come from your management but from yourself. Write down your goal and post it anywhere you can. Right next to it write a reward that you will give yourself if you manage to achieve that goal. Maybe it’s a nice vacation, new gadget or pair of shoes. This will help you keep a positive mindset and never lose your motivation, no matter how hard the situation gets. Even if the material reward does not come in the end, you will always know that you managed to achieve something that at some point seemed unachievable. No matter how good of a seller you are – there’s always someone better. No matter how good your relationships are – there’s always someone with better skills. Make sure you did everything in your power to close the deal and if it doesn’t happen, keep in mind that it’s just something you couldn’t control. You can never know all the details that happen in your prospect’s decision-making process and even if you did – you simply couldn’t affect them. Leave those that were not meant to be and focus on those that are more likely to close. Are you sure you’re targeting the right companies? Are you contacting the right people within those companies? Unfit leads can be a great source of time waste and therefore frustration. No amount of sales skill can convince an unfit contact to buy your product. If there’s a large number of companies that you’re reaching out to but none of the deals are closing – have a talk with your superior to check if the targeting is correct. It is highly unlikely you will have time to look for leads in Q4, so try to outsource your lead generation and get highly targeted hand-picked leads delivered to you. There are myriad of companies looking to spend their annual budget in order to get the same amount next year – this is your chance. Ok, so maybe you have perfectly fit leads that are just waiting for your email, but are your cold sales emails any good? If you notice particularly low open and reply rates for your email campaigns, it’s time to review those cold sales email lessons. Check your subject line, personalization, messaging and call to action. Are you addressing their pain-points or just bragging about your achievements? 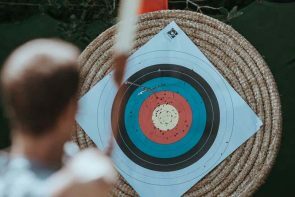 Are you writing concise emails that go straight to the bulls-eye or are you writing Lord of the Sales trilogy? Once you master those, none of your emails will go unnoticed. Look for the former clients, those you are already working with, those that said they might be interested a few months ago and especially those currently in your pipeline. If you can, offer them a better deal to help them decide on buying. Or send a piece of amazing content that shows how big of an industry expert you are. There are huge opportunities for up-sell and cross-sell with your current customers and those are your safest bet. See if your old and current customers can give you any referrals, which are more likely to result in closed deals that just reaching out blindly to new people. Still Not Meeting Your Quota? We’re not pointing any fingers, but if you did everything you could and we really mean everything and you’re still not meeting your quota, go and talk to your manager. Try to figure out whether your quota was realistic or just the result of your company’s wishful thinking. It may be too late to change it now, but at least you will have a valid argument if you discover that the bar was set just a bit too high. Is your superior making you close deals with companies that don’t seem to fit your Buyer Persona? If so, try to talk to your superiors and see if you can change your Target Accounts before it’s too late. How about the office morale? Are there tears coming out of your eyes every time you think about going to work and the pressure is a bit just too high? This can be an enormous demotivation to anyone, so have a talk with your colleagues if they’re feeling the same and organize a meeting with your management about how you can ease the stress. If you still have trouble closing deals in Q4 – let us know, we would love to help. Lead qualification is not easy – and there is no one universal way to do so. But, we’ll help you come up with your qualification system. Here are questions to ask your leads to qualify them properly and sell more in Q4. Q4 is undoubtedly the most difficult time of the year for any salesperson out there. You have to push really hard to meet your targets and it all becomes very stressful. But it doesn’t have to be so. No with these best practices for Q4 selling.